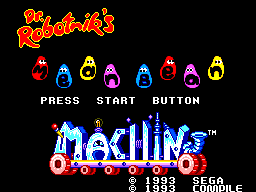 Dr Robotnik's Mean Bean Machine (Or Mean Bean "Machin", according to the title screen) is the US/EU localization of Sega's classic puzzler, Puyo Puyo (Or Puyo Pop, as the few english-released games are called). The plot goes that Dr Robotnik is using the cheerful beans to power his new robots, and has made a huge machine to "roboticize" them in. You (who you play as is never clarified. I always just assumed you were Sonic) must free the beans from their dungeons and ruin Dr Robotnik's master plan. The Mega Drive version of this game was the first falling-block puzzler that I ever really got into, and remains one of my favorites today. The question is though, how does this port stack up compared to it's more well-known Mega Drive counterpart? For almost every mode in the game, gameplay works like this: the different colored beans fall down, and you can control where they land, and rotate them, in a Tetris-like fashion. Once they land on the ground, you can't move them anymore. If you match up 4 or more beans, they disappear. If the beans reach the top of the screen, it's game over. You can also set up combos, to clear more beans, and get more points in the process. For example, a simple combo would be if you had 3 yellow beans on the ground, and 3 red beans on top of them. Then, if you put another yellow bean on the red bean, and cleared the red bean, the red beans will disappear, and since there will be nothing for the yellow bean to sit on, it will fall down, land on the 3 yellow beans below, and clear those at the same time. This is a nice feature, because it lets more advanced players play the game in a more technical fashion, setting up many combos to rake in points quickly, or a more inexperienced player can just focus on clearing 4 beans at a time, and maybe making very simple combos. Also, in scenario mode or 1P vs 2P mode, by doing combos, your opponent, who will also be playing the same game on the other side of the screen, will get his board filled up with metal beans, also known as refugee beans. The metal beans can not be cleared by matching them up. To clear them, you must clear a different kind of bean beside it. When the normal beans are cleared, any metal beans touching them will be cleared at the same time. The game has 4 game modes. Scenario mode, 1P vs 2P mode, Exercise Mode, and Puzzle Mode. I'll go over each mode in depth. Scenario Mode is the main mode in the game. 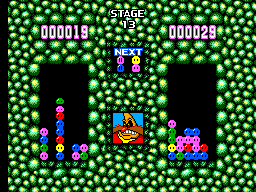 In this mode you play the game against Dr Robotnik's many minions, and the first person to fill up their game board loses. They start off very slow, and almost kind of boring. At the start of the game, you might be a bit off-put by the game's slow pacing. It quickly builds up though, as minions start making more combos, and the beans start to fall faster. By the time you get to the final stage, Dr Robotnik, the difficulty will be relentless, with the beans falling like rocks, and Dr Robotnik setting up the most insane combos that can fill up more than half of your screen. Anyone who can actually manage to beat this game has my respect (although I did manage to beat Robotnik, it felt like a complete fluke). To make things easier on you though, there is a password system. You get a password after each level. What bugs me about the password system, is that it isn't just as simple as a 4-digit long code, like say, "JWDX", or something. Instead it's made up of pictures of the different beans. Since they all look the same, you can't draw them unless you have some coloring pencils, so you're going to have to write out each bean you see, like "Metal, red, blue, that weird bunny thing with a name no-one knows". It's not as infuriating as the long passwords you get in a game like Wonder Boy 3, but it's rather annoying. There's also sadly no difficulty options for Scenario Mode, like in the Megadrive version, but since the game already has a pretty good learning curve, it's not too bad 1P vs 2P mode is basically the same as Scenario mode, so I'l skip explaining this. Just imagine Scenario mode, only with a friend having the role of Dr Robotnik's minions. Exercise Mode is my personal favorite mode. You just play the game alone, without any opponent, and try and get as many points as you can, until you fill up the board. The speed gradually picks up as well, adding more challenge as well. Without having to worry about Metal Beans, you can set up combos for ages, and practice for Scenario Mode too. It's also very fun to try and beat your high scores on this mode too. This is the only mode in the game with a difficulty setting. Basically, all it does is start the beans falling faster at the beginning of the game, but other than that, it's the same. Finally, we have Puzzle Mode. This game gives you several different missions for you to accomplish, such as "Clear all blue beans", or "Clear 11 beans at once". There are 30 missions in total. In each mission some beans are already on the playing field, to help, or hinder you while trying to clear your mission. Much like Scenario Mode, the levels start off simple, and then the later ones will have you scratching your head asking yourself "How the heck is THAT supposed to work?". I found that the later missions could sometimes get a bit frustrating, and can detract from the fun, but if your into brain-teasers and logical puzzles, chances are you'll enjoy this mode. This mode is also exclusive to the Master System version, so you won't find it in the Mega Drive version. Overall this mode is fun, but probably won't detract from the other modes. The graphics are a bit of a mixed bag. While things such as the Game Over screen and the textures around the playing fields look rather advanced for an 8-bit console, the graphics in the playing field are rather basic. The beans are little more than little colored circles with two black dots on them, and the background is completely black. The in-game pictures you see of the robots look fine, but Dr Robotnik himself looks ridiculous in-game, with a head that looks like a deformed potato, a dippy frown with his teeth clenched, and an neck that stretches like elastic out when he gets panicked. Overall though, it doesn't look terrible. It's just average at best. The music gets repetitive very quickly. For the first half of scenario mode, you have a rather decent theme, but then halfway through, it changes to a much more bland and repetitive theme. Sadly the more repetitive theme is also used in Exercise Mode. 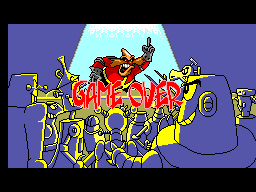 Dr Robotnik has his own theme though, which sounds fantastic, and the music in puzzle mode isn't bad either. So once again, this feels like a mixed bag. The controls, once again, are your simple Tetris-esque controls. The beans move responsively, but on later levels, when the beans are falling very fast, it can be difficult to be able to control them while trying to keep up with the speed of the game, and sometimes you may rush too much and misplace a bean. It feels hard to blame the controls too much for this though, since it's more just a difficulty spike. Anyone can easily pick this game up and play it, without having to know several advanced control techniques, which once again, makes it great for all different kinds of game players. The game is very replayable. Scenario Mode sadly loses some of it's replayablity due to the difficulty options getting removed, but is still challenging enough to keep you happy anyway. The same can be said for Puzzle Mode, and of course with Exercise Mode and 1P vs 2P mode, you can play those constantly without them getting dull.